BOOK YOUR LAKE IDA TRIP NOW! Park. There is also shore access along the east side of the canal between Lake Ida Road and the I-95 overpass. Fishing piers are located north of the Lake Ida boat ramp, next to the boat ramp at Pioneer Park on the Boynton Canal (C-16), and east of the boat ramp on Lake Osborne. Nearly the entire shoreline of the north lake of Lake Osborne between Lake Worth Road and 6th Avenue South is accessible to shore anglers. The E-4 Canal and associated lakes and lateral canals provide excellent fishing for largemouth bass, bluegill and redear sunfish. Sunshine bass are also stocked in Lakes Ida, Eden, and Osborne. While fishing with our Lake Ida fishing guides we like to share with you all these locations and more, take you to the non public areas. The central E-4 and Boynton (C-16) canals have more largemouth bass than most other southeast Florida canals, and 30% are larger than 14 inches. Overall , the average size of largemouth bass is 13.2 inches (1.1 pounds). Fishing for largemouth bass tends to be best during the winter when the water temperatures are cooler and in the evening, night, and early morning during the summer. The bag limit for largemouth bass is five fish per day, only one of which can be longer than 14 inches. The number and quality of panfish in these systems is higher when compared to other area canals. Live worms and crickets are the choice baits for many panfish anglers, although fresh bread or bread dough works well, is readily available and it costs less. After a series of warmer than average winters, a few butterfly peacock have also found their way into this area. 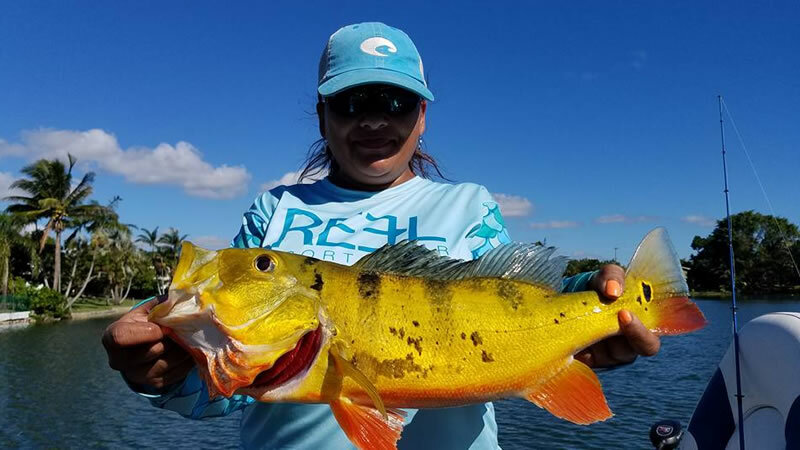 The butterfly peacock is a world renowned gamefish that was successfully introduced by the Florida Fish and Wildlife Conservation Commission in the mid 1980's to eat undesirable exotic fishes, and to provide more sportfishing opportunities for anglers in southeast Florida canals. The bag limit for butterfly peacock is two fish per day, only one of which may be over 17 inches. Butterfly peacock are sensitive to water temperatures below 60oF which makes them susceptible to periodic winterkills in the E-4 Canal system. In addition to largemouth bass, bluegill, and redear sunfish, central E-4 Canal anglers can also catch several exotic fishes including oscars from South America, spotted tilapia from Africa, and Mayan cichlids from Central America. These exotic species were illegally released and pose a threat to native species. Oscars, spotted tilapia, and Mayan cichlids are all bream-shaped fishes. Oscars have a red or orange circle at the base of the tail, and have a thick layer of protective mucus on their bodies. Spotted tilapia are golden with black vertical bars or spots, and some have red on them. Mayan cichlids are colorful and snapper-like in appearance with a turquoise ring around a black spot at the base of their tail. These exotic fishes taste good and you can keep every one you catch. The central E-4 and associated lakes and canals receive a great deal of fishing pressure so we encourage anglers to release most, if not all of the largemouth bass and butterfly peacock they catch. If anglers don't release most of the sport fish they catch, these high quality fisheries will deteriorate rapidly. DESCRIPTION-The E-4 Canal is located in eastern Palm Beach County and flows south through a series of naturally occurring fishing canals, but highly modified freshwater lakes. The E-4 Canal connects the West Palm Beach Canal (C-51) near Palm Beach International Airport with the Hillsboro Canal (G-08) in Boca Raton. The E-4 Canal offers anglers nearly 17 miles of fishable waters as it flows through the Ida-Osborne chain of lakes and provides anglers access to 670 acres of lakes and 23 additional miles of boatable canals. This map listed below highlights the central section of the E-4 Canal system between Lake Osborne and Lake Ida. The central section of the E-4 Canal flows through the cities of Lake Worth, Lantana, and Boynton Beach. The canal in this area is characterized by sloping sides stabilized with concrete revetment, ranges in width from 50 to 180 feet, averages about six feet deep, and has a sandy bottom. The lakes in this section include 50-acre Lake Eden, 120-acre Lake Ida, six-acre Lake Constantino, 20-acre Lake Leisureville, and 380- acre Lake Osborne. From the boat ramp on Lake Ida, it is 5.3 miles to the Boynton Canal (C-16) and 7.8 miles to Lake Osborne. Traveling west from the E-4 and Boynton Canal intersection, it is 1.3 miles to the water control structure . Traveling east it is 0.4 miles to the Pioneer Park boat ramp and 1.8 miles to the salinity structure (S-41) near Federal Highway. The Boynton Canal ranges in width from 90 to 180 feet and averages about nine feet deep. BOAT RAMP DIRECTIONS-There are four public boat ramps on this system; all can be reached from I-95 by exiting at Atlantic Avenue, Boynton Beach Boulevard, or 6th Avenue South and using the map. These ramps are paved, well maintained, and located in city and county parks with plenty of parking, picnic tables, grills, playgrounds, and most have restrooms. All these parks are open from dawn to dusk. The entire length of the E-4 Canal is posted as "No Wake Zone" so boaters should plan their trip accordingly. The E-4 Canal has many low bridges and overhead pipes and care should be taken when going under them. Another cool feature of Lake Ida Park is the dog park. If your fishing companion is a dog, there's two fenced areas one for smaller and one for larger dogs, with a bathing area in between. There are a few benches in each, and some trees.